The OSU Rate of Heat Release Apparatus is used to expose aircraft interior cabin materials to an incident radiant heat flux of 35 kW/m2, to comply with FAR 25.853 requirements. 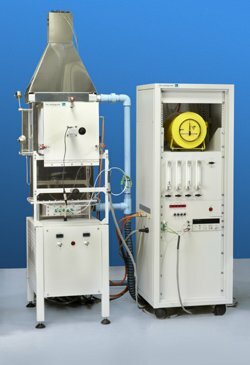 The apparatus, built in accordance with FAA Fire Test Handbook, Chapter 5, is provided in three parts: test chamber, control unit and data acquisition and analysis system. The unit can also be modified to comply with ASTM E 906 and to conduct tests at different incident heat fluxes, for research purposes. The unit can also be supplied with several options: smoke measurement system (white light or laser), oxygen depletion calorimetry (shown in rack above) and facilities for monitoring sample mass loss continuously.